What’s the ideal cruise for couples? It’s a combination of sharing new experiences and having a little space to follow your own impulses. A couple’s cruise is designed with just that in mind and is perfect for honeymooners, those enjoying an anniversary or a couple that simply wants to reconnect. It starts with all the simple things taken care of: meals, a beautiful and restful suite, private balcony and plenty of windows for viewing the passing scenery, full bath and shower. 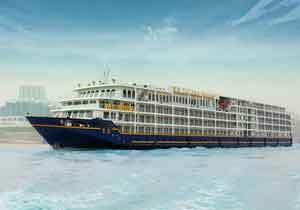 The Yangtze cruises cater to Western sensibilities with an excellent staff to passenger ratio, no crowding, and generous space with high ceilings and full-sized beds. Your cruise ship is like an oasis gently floating down the broad river – all the adventure of China with the safety a land-based tour cannot offer. Add to this the fine dining and entertainment, and for many, this would be enough to make a memorable honeymoon. But sometimes couples want to share something more exotic and get a little adventurous. It may start with a morning stroll around the deck, holding hands and watching the sun rise above the sheer walls of the gorges. But maybe a spa is more to your liking? What about a massage or a manicure to feel a little bit pampered? Sustained with a good meal and some relaxation, it’s time to reach out and share some of the experiences on offer. There are cultural presentations with dancing and theatre, language and history lessons, and best of all excursions that take you off the ship and into the surrounding landscape. Whether it is a cable car ride up a mountain, a walking tour of the Three Gorges Dam or a visit to a temple complex, getting out and about with your loved one will create long lasting memories. Social opportunities with other passengers are available, and the chance to meet other couples from around the world is a highlight of the trip. Of course, when you want it, privacy is also nice. This is where the advantage of a suite with a balcony comes in. Huge windows are the norm, and there are pleasant hours to be had with a loved one, just watching the natural beauty slip by.